Emerald flourishes and gilded finishes give this lakeside Wisconsin living room a royal, one-of-a-kind look. Imported Italian velvet on the chairs and throw pillows create a colorful opulence in contrast to the whites and grays throughout the room. The custom settee was inspired by elegant European hotels and serves as a conversation starter in a space designed for socializing. 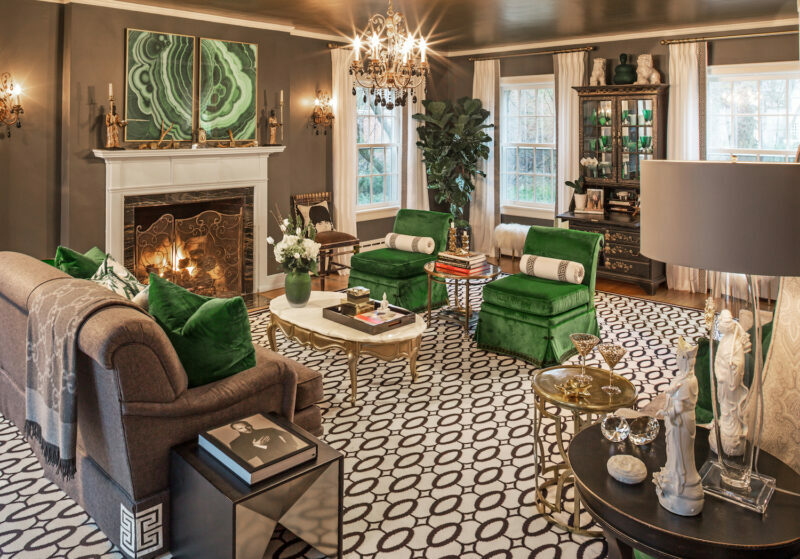 Built in the 1920s, this client wanted a living area that was unabashedly glamorous and true to her high-fashion taste, while paying homage to the home’s heritage. In addition to the hand-picked fabrics and finishes, the custom details are what set this space apart. From the Greek key appliqué on the sofa and curtains to the fringe trim on the settee, every detail mingles together to create a truly unique atmosphere.